As a footnote, I'd like to say that I did actually read some other reviews and the author's book commentary before I started this review. I needed some information to make my rating completely justified, and I feel as though I have that now - which I will explain in further detail within my review. When the book starts, you meet a present-day Janie dealing with what is your first insight into her "condition". You learn that whenever someone goes to sleep in her presence, she instantly gets sucked into it. She's not narcoleptic - she's actually aware of her surroundings during the whole thing - she just can't control her gift enough to get herself away from the dream. She doesn't tell anyone about what she has to go through, she just keeps to herself about it. If at all possible, she avoids being around anyone that falls asleep ... but school seems to be a problem, considering that kids can and do fall asleep in her classes. She's pretty used to the petty dreams that highschoolers have because they usually just center around that person, a crush they may have, or something more perverted. However, that changes one fateful night when she happens to drive past a house where a guy is having a nightmare and actually murders someone in his dream. It shakes Janie up - and shakes her up even more when she figures out that the murderer notices her in the dream. I love the plot of this book. It's something that hasn't been touched on a lot in the YA genre and has a unique feel to it. Having said that, I have to point out my biggest problem with this book: the writing style. Short, choppy sentences. Incorrect grammar. Too many time flips. I do love the concept of the timestamp, but I feel as though it was overused. The positive to this was that the dates helped out a lot when it flipped from present to past, then back again. As I said before, I've read reviews and I've seen the commentary on the writing style - but, I just cannot accept it. Call me a grammar nazi if you'd like, but I'm a stickler on using complete, descriptive sentences. I don't believe in ending a short sentence, only to use "but" as the beginning of a new sentence. Yes, I know "but" can be used to begin a sentence when used with "for" or "what" as an idiom - I just don't agree with it. Nor do I recall if this was the case when used in this book - I'm just stuck on short sentences. I'm also shocked by the fact that people see the use of short, choppy sentences as "lyrical" and argues that such is better to keep the attention of young adults. As a student, I was taught in school that you have to pause after each period. Doing so in this book gives me a headache. Periods indicate the end of a complete thought. It's not the case in Wake. The author argues that the reason it was written that way was because it was just the way she wrote it out the first time. I agree with this. As a writer, I know that most authors do tend to write short sentences when writing their first drafts. It allows the author to get everything out while their mind is going, and then they can go back and edit with more description. While this book had description, I didn't feel like it had enough. It was written in third person so it had the potential to give you a wonderful look at the world around the characters as well as more insightful feelings inside of the characters. I feel as though I was cheated of these things and felt as though the characters lacked growth and development because of it. I'm getting off the subject of the review. Writing is a bit of a soft-spot for me. ;) Despite the writing, the story is wonderful. Normally, I tend to trash reading the rest of the series if the grammer gets to me, but I can't see myself doing it with this series. Why? The story is THAT good. The characters, while I feel I'm missing some of their depth, do have enough to them to keep me interested. Even if I don't know their past or most of their present, their actions can sometimes speak louder than words. My emotions did get tangled up in the story because these are true characters, most with not-so-perfect lives, that you can relate to. Janie is also NOT a Mary Sue ... and that is something in YA that you don't see much of. She's actually flawed and sometimes makes bad decisions. Like I said, you can definitely relate to the characters in the book. Dreams, we all have them. Sometimes we remembered them, sometimes not. They may be what on our subconscious we desired the most or completely the opposite. But for Janie Hannagan, dreams are her worst nightmare, and they aren't even her dreams. She is not a ordinary seventeen year old girl, she has the power to witness that dreams of people who happen to fall asleep close to her. Of course, she doesn't likes it; but, she can't seem to do anything about it since the first time she experienced it, when she was only eight years old. She hasn't told anyone about it; doesn't want to be called a freak. But, when Cabel, a fellow classmate, falls asleep in the same place as her, she enters his dreams and everything changes. She feels he would understand her. She doesn't just fall in his dreams, she falls in his life, and may also be falling in love with him. With his help, she would learned how to control the dreams by helping those who dreamed them to change their dreams, so they can learned from them and accomplished unfinished tasks in real life. Although, I found the writing a bit weird at the beginning, it somehow work rather perfect for the story, making it unique and pleasant to read. This was an impulse buy for me, and I put off reading it for a long time. I won't make that mistake with the sequels. The writing style is spare and utterly compelling. The characters come to life, the dreams were vivid and sometimes scary, and I gobbled this book up. I didn't expect the romance to have the depth and heart that it has. I really LOVED this book. A young girl that gets trapped in other peoples dreams falls into a nightmare like no other she has never experienced before. Young Janie alone, and scared in other peoples dreams can not take it anymore. 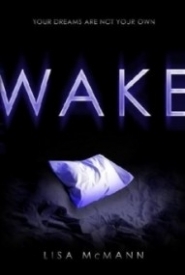 Another thing that just doesnt help with the situation is that Janie can not tell anybody about her problem because they would think that she must be crazy and making up lies which arent good for her at all .Wake is the type of book that you can not put it down for one second. It has mystery in it, which most people enjoy because it keeps you thinking, about whats going to happen next. The way this book was formatted was another thing that made me enjoy it even more. The set-up of it being in diary formation made it more interesting, even by putting the times, dates, and places because it wasnt set-up to be like any other type of book. Because its set-up like this it makes the young readers more interested because its not set up like a normal boring book would be like. But sometimes the format of the book could be kind of confusing because it would switch from different times in the story either its from the past or the present time, which was confusing because sometimes you would have to re read what happened from what you red previous to what you just read. So in this book you would have to pay really close attention to because its the type of book you would get lost on because of the time of book changes constantly through out the story. Wake leaves you with confusion after every chapter, making you want to keep reading to know what happens next and then so on, it leaves a mystery behind, which makes the book so much more interesting. The story line in this book is so unique and different which makes the book perfect for young teenage readers. Her writing style had a good flow as well that just kept them interested every bit of the story. She made the storyline of the book as interesting as the main character in it. Janie was a unique and interesting character; she was a good representation for a teenager, which made it seem realistic. I recommend this book to many young teenage readers because it has tons of mystery and excitement in the book. I think young girl readers would appreciate this book a bit more than boys would because it has more of a girl background to it. I also like how they put a sequel to this book, so that you could read on to what happened. Get ready for some more excitement coming your way!!!! Wake by Lisa McMann is a book following Janie Hanagan who has an involuntary ability of being sucked into the dreams of the people around her. She officially fully notices her secret talent at the age of eight, and throughout her years, and into high school, the effects grow stronger. A traumatic event in a dream that she doesnt understand leads her eventually into Cabel. Cabel and Janie act as the love interesting the novel but they both have important roles in helping each other with their problems. Janie tries to figure out the meaning of Cabels secret dream and the story behind it while Cabel, in a way helps her control her dreaming ability. The whole thing itself seemed a little short, but had good visual vocabulary. One thing however that could have been explained better were the transitions that were in between chapter. For example, One day Janie would be ten years old, then an event would happen, then it would say she is sixteen. The huge jump keeps you wondering, and leaves you with unanswered questions that just leave you hanging. I think it lacked detail from that. It had a dreamy like3 vocabulary that made things feel unreal when she was talking in real life, and not in dream land. However, the types of dreams that are written are very realistic to ones that I and you would have. Everyone has had those dreams that just catch the eye and are with you forever, and in Wake, it explains in detail just that. I believe that dreams have meaning of what you feel, what you need to do, and perhaps a future. When you are in sleep mode, your brain takes control and acts separate from your body. Its like your body goes inside your brain and explores the specific map it made. This book has plenty of thrilling scenes that will catch your eye, and can totally change your opinion on the entire book. But this novel is the type that its either really good or just a book on a shelf with the rest. I would rate this book a three out of five because it didnt have that mind blowing ending that would make you want more, but its relations to what teens go through are on the spot, and are really relatable. Wake by Lisa McMann is a definite read if you have a thing for short stories that you can read for fun. The novel Wake, by Lisa McMann, is a story about a seventeen year old girl named Janie, who gets sucked into peoples dreams unwillingly. Janie has been living with this power since she first discovered it, and always having the burden of carrying it around, and has never been able to tell anyone about it, afraid that people would think she was a freak or just plain crazy in the head. All Janie has ever wanted was to be normal like everyone else. Cursed with a power that she never wanted in the first place, which she cant even control, and having to work long hours even on holidays, to save for college, living in a poor neighborhood, being teased at school by the popular students, and also having to live with a mother who drinks all day and night, and who barely even knows that her own daughter even exists most of the time. Janie thinks her life is officially over. Until Cabel, a boy at school steps into her life, and changes everything for her that she never thought could happen. She discovers new information and details about her powers, and now Janie gets sucked into strange nightmares that could get her caught up into events that she never planned to be in. When I got this book I thought I wouldnt like it because I havent read this type of story before. But I was really surprised when I read it. The characters in the story were very believable, and you could feel what they felt at moments, and could relate to at least one of them in your own life. Also the characters in the book were very likable, I was able to understand them, and thinking that there could be kids just like them out there, and it made me want to read it to learn more about them and to get to know what situations and life they lived and had. I was really surprised on how fast I read this book, I was flipping through page, after page, to see what would happen next, not wanting to put it down for a second, wanting to know more about the story, and trying to put everything together as I read. Once finished, I was very satisfied on how the story ended. McMann was able to make the events in the story flow very nice and smooth, and have everything come all together at the end of the book perfectly. Which I didnt feel like I was left hanging there, and I didnt feel all confused on what had just happened. In all I find this book to be great read, and will be continuing to read the rest of the series. I would recommend this book to any teenager to pick it up and start reading it, and I guaranty that you wont be disappointed once you open up this book up and start reading it, you will be flipping through pages, without even knowing it, and you wont be able to put the book down. In the book Wake, Janie is sucked into peoples dreams whenever there is someone sleeping around her. She cant control it, cant get out of it. She can hardly stay awake at school because there are constantly kids sleeping and dozing off during class. Stuck in this world that she cant escape, she eventually discovers that she has more power than she thinks she does. The book keeps you interested and always wanting to know what happens next. The teenage dialogue in the book makes the story believable like Janie is a typical high school student, but with a big secret. What I really liked about the book was that it goes back and forth from dream to reality, and it makes you feel the confusion Janie must feel. She can hardly grasp what is real-life and what is only a dream. Shes slowing slipping out of her reality and losing herself. The only thing to criticize in the book would be the ending, after everything, the ending is boring and tasteless. It lacks the need for more information and the wondering of what will happen in the characters lives next. The ending almost takes away from all the books good qualities. But, the constant twists and turns in the plot keeps it exciting enough to hold your interest enough to continue reading. It makes you feel vulnerable for Janie. Shes her own victim and keeps her problems bottled up inside her making you wonder when theyre all going to come out. There a lot of small characters in the book that have a big impact on Janie. She is on her own until she starts talking to Cable, whose shes known of since she can remember. Thats when things really start to take a turn for the good. Janie will reveal her secret in the book eventually to the least expected person, which makes you wonder if she really does cherish her talent. Towards the end shell have a change of heart towards her ability to see peoples dreams. Its still unclear whether she accepts it for what its worth, or if she cant get past falling asleep unexpectedly. The inability to ever get rid of her talent makes you think throughout the whole book if anyone will ever accept her for who she is. It makes you curious if people really knew who she was if they would cast her out as a freak or invite her in and be supportive. Shes always spiraling out of control into another world. While keeping her secret she has to come up with excuses as to why she dozes off, paralyzed almost. This is probably the biggest hardship for her, becoming paranoid if anyone is suspicious of her, or if anyone is catching onto her sudden naps throughout her day at school. Wake is an enticing book that is definitely worth reading. The excitement never ends, and the drama crashes down on Janie constantly. The novel Wake by Lisa McMann is about a teenage girl named Janie who has the ability to get sucked in to other peoples dreams. One may think that her talent is all positive however she hates it. Janie can not control her ability, therefore it affects her everyday life; she looks at it as more of a set back than a gift or ability. While trying to cope with her disorder Janie finds a love interest which definitely has its ups and downs. Janie later realizes that she has a gift rather than a disorder. Lisa McMann does an excellent job in drawing the readers into the book; her book relates to teenagers lives and is pretty realistic. One thing that McMann portrayed in a realistic manner is the difference between the more wealthy families and the not as wealthy. The more financially stable students hang out together where as the lower income kids hang out together. McMann hit the bulls eye with that one, money is a big deal in high school. McMann also was correct when writing that her character Janie hates the fact that her ability keeps her from being a normal teenager, in that most people do not realize what abilities they have and some times sees them more as disabilities. And unfortunately it does seem that teenagers are growing farther and farther apart from their parents. After reading Wake, I realized how independent Janie was and how strong willed she was; her mother was not there for her and played a poor mother figure in her daughters life, Janie had to figure out all her problems herself and had no one to talk to until Cabel came into her life. McMann also did a superior job in making her characters normal and not annoyingly perfect, she made sure to show her readers that no one is perfect and that everyone has problems or setbacks that they struggle with. Another positive about the novel is that it was always changing and was never boring or predictable, it was one of those books that one was easily sucked into and always wanted to know what happened next. The part in the novel where Janie got sucked into a dream while driving really made me realize that her condition can have dangerous or even fatal consequences if not careful. If Janie was on a busy street it is possible that her blackout could have killed her, that was the point in the book when i realized that her condition is more severe than thought to be. Lisa McMann did a great job in attracting teenagers to her novel. It is a book that teenagers can relate to and seems more typical and relatable than fairy tails and is not as plastic and fake. Over all this book is excellent for the high school group. Wake is a book about a teenage girl who has the power to get sucked into other peoples dreams while they sleep near her. Although some people would love the ability to see into the subconscious mind of others, Janie views it as a curse that she can never give back to wherever it came from. Her gift leads her down many conflicting paths and makes her ask questions that no one knows the answers to; it makes her look inside herself and underneath the surface of other. Although she may find some things that she doesnt agree with or exactly understand, they help her in the long run and help understand how the mind of the world works. She experiences hard ships and confusion, but with the help of unexpected friends, she figures out how to deal with what she thinks is a burden. This book includes graphic dreams and intense realities, but it relates to the lives of many teens and young adults in our time. In my opinion, the author hit it right on the bulls eye. I liked the book because it gave me an inside look into something that I am really interested in knowing more about: dreams. In this book dreams are more like reoccurring nightmares that Janie gets sucked into. I believe that the author wrote the dreams to be so intense so that the reader would feel the suspense and the curiosity the characters have in the book. I also like the more romantic side of the book; it shows that books can have more than one side other than just having mystery or suspense. Having more than one aspect of reading genres helped me relate to the book better verses how it would be if it was just one genre. When the author puts in the twist, that I think basically makes the book better, it helps the reader get some unanswered questions, answered. I really liked this book because there was so many things that I could understand and I loved how when the author described the dreams, you felt as if you were in the dream yourself; that skill, I find, is hard to see in modern young adult books. I think Wake is a book I would easily want to read again. I think teens would enjoy this book because it has some aspects in it that relate to some teens lives. I think they would enjoy this book because once you get into it, it is difficult to put the book down, it keeps you guessing and has a new twist at every corner. Wake, a book about dreams, troubles, love, and hate, is a great read and I think people of all ages, even beyond teens, would enjoy wake by: Lisa Mcmann.